The whole of Egypt is in uproar â€“ Akhnaton, who has just acceded to the throne, wants to ban the old deity Amon from the temples of the land. Aton is to be worshipped as the new God. What is great about this 2-player abstract, is that there are never any easy choices. Each turn you have to distribute 4 cards to 4 very different "regions" where they serve different purposes - and you aim to score higher then your opponent in all or some of them. 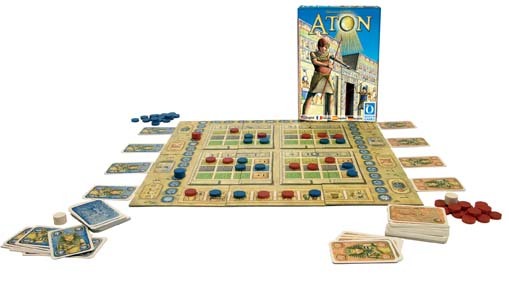 When these many choices are coupled with multiple paths to victory, Aton turns out to be a very engaging and deep game that has tons of replayability too. Great 2 player game. Very unique and awesome for 2 players. Quick, portable, abstract, surprisingly fun game. This may be the perfect coffee-house game.